Music for big kids and little kids and also medium-sized kids. Original art by Rosabella, age 6. Email your original art to doubledip@wfmu.org to have it featured! The Underground Goblins ("To Spring") Time For Spring! Hi, beautiful souls young and old. As always, you can be a part of the show! Please feel free to communicate with us anytime. I'll make my bed later....promise! Good morning Roger and Amanda and all other Double-Dippers! Love the Peter and the Wolf intro. My first memory of music. Welcome back from the marathon, all! And special hearty thankx to all who pledged to our show! ..what a lock of hair Rosabella! Yes, John from Florham Park, I am still around . Saturdays is a day of continuous WFMU listening. Every show is the right music for that time of day. Nez Pa? These braids are epic, Rosabella! I am a buckeye as well, Roger. Where do you hail from? You must know riddle my dad told me: What is high in the middle and round at both ends? What do you call an alligator detective? An investi-gator. There's a parody cartoon that starts "A Series Of Unfortunate Events" that is interrupted by Lemony Snicket and his sad story. But the whole uninterrupted song is onthe OST! And that Cartoon is "Loverly Spring". Nice avatar, Henry. It reminds me of Alexander Calder's circus. Good morning! So the Ohio Express story is convoluted but suffice to say that bubblegum Svengalis Kasenetz and Katz had a song to promote and no band to tour it, so they hired an existing band from Mansfield, OH and gave 'em a new name. Regardless, that's of course Joey Levine on Chewy Chewy and many others. @melinda, it's Paul Klee's Twittering Machine, that I animated about 25 years ago. listening with my 22-month old daughter... what about some Michael Hurley? I would love to see him do a kids concert in NYC. I once saw him play the family tent at the Newport Folk Festival and it was amazing! "Are Porky and Daffy pantsless" is a question like "Is Goofy a Dog, and if so,what is Pluto?" @M - I love Michael Hurley! We have played him on the show before. Great request. Probably no time to get to it today but def in the future. Do you guys know "Music For Aardvarks?" David Weinstone has a song "Have you seen my Nose" which is suspiciously like "The Shadow Of Your Smile". Just free associating here. This set shows true curatorship. This is the best segment you've ever done! @Amanda We were in one the first M4A classes, stayed for a few years. I may still have a lot fo the cassettes! I had this song playing in my head at work yesterday, Double-Dip Recess, Double-Dip Recess. Good morning everyone. 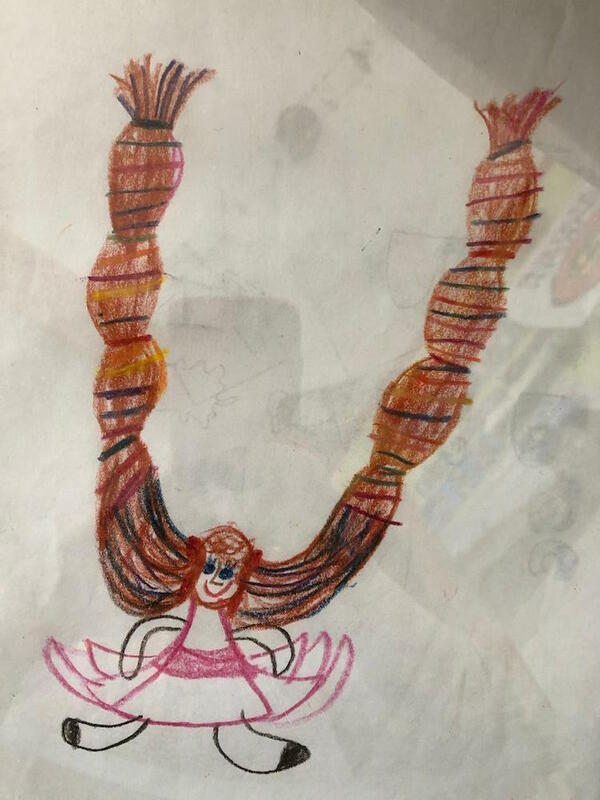 If you are going to draw braids, draw braids...who wouldn’t love braids like that? We used to sing Pierre a lot! Really Rosie rocks! @yippie that's exactly what he would say, but I guess the spelling was different. Cooh John glad you could make the trip to marathon too! I visited from Maine. Smurf, chipmunk and twiddlebug voices always lift my spirits. In 3/4 time, no less! Throwback to Greasy Kid Stuff! Hi, gang. Just stepped into the store for to get supplies for my daughters birthday party so I missed the song. Shazzbot, as Mork used to say Thanks for the shout-out. Thank goodness for the archive. @melinda: going to the marathon is my yearly pilgrimage. 3 years now. Thanks Cooh John, for the CD and for thinking of us!!! Crud. I missed Bulbous Bouffant. @John I hope to do it every year too, this year was my second time. UM, that's what i was just thinking. Your welcome, Amanda. I love sharing the music and joy. Hi, melinda! So awesome that you and Cooh John and so many other devotedfolx were able to travel to JC to volunteer. That's my goal for next year—from San Francisco! My heartfelt apologies to everyone who unfortunately missed "Bulbous Bouffant"
melinda, it is the highlight of my year. I now have a whole year to look forward to the next one! It's not your fault, Amanda. I have no one but my little brother to blame. Roger says "aww, Granny, that is really nice of you!!! Shucks." Thanks for the great show Amanda and Roger! Thanks, gang! Looks like i missed some great sets, totally checking this out in the archives. YAY WFMU!